Love baby, love. That's the secret, yeah. If lots more of us loved each other, we'd solve lots more problems. And then this world would be a gasser. That's wha' ol' Pops keeps saying. 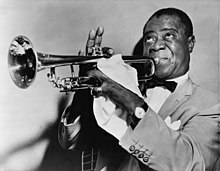 Louis Daniel Armstrong (4 August 1901 – 6 July 1971) was an African American jazz trumpeter, composer and singer who became one of the pivotal and most influential figures in jazz music. His career spanned five decades, from the 1920s to the 1960s, and different eras in jazz. Some of you young folks been saying to me, "Hey Pops, what you mean 'What a wonderful world'? How about all them wars all over the place? You call them wonderful? And how about hunger and pollution? That aint so wonderful either." Well how about listening to old Pops for a minute. Seems to me, it aint the world that's so bad but what we're doin' to it. And all I'm saying is, see, what a wonderful world it would be if only we'd give it a chance. Love baby, love. That's the secret, yeah. If lots more of us loved each other, we'd solve lots more problems. And then this world would be a gasser. That's wha' ol' Pops keeps saying. When you're sick [due to drug withdrawal], music is a great help. Once in Texas, I kicked a [heroin] habit on weed, a pint of paregoric, and a few Louis Armstrong records. You know you can't play anything on a horn that Louis hasn't played — I mean even modern. … I love his approach to the trumpet; he never sounds bad. He plays on the beat and you can't miss when you play on the beat — with feeling. That's another phrase for swing. I knew Louis well, he had his crazy little habits. Everyone thinks he was a druggie, but he wasn't. After every concert, he would put on a stocking cap, then he'd have his bottle of Pluto water, orange juice, Serutan and a joint. This was his formula; in fact, he used to post the recipe on bulletin boards, calling it "The Road to Good Health."